Yesterday’s Costa Rica vs Greece – World Cup 2014 soccer game was amazing. Team Hellas made history. They reached the last 16 for the first time. But in a penalty shootout they were defeated by Costa Rica. Antonis Samaras, Greece’s Prime Minister, sent the team a telegram that said: “Greeks are proud of our national team. Congratulations to all the boys.” I’m still super proud of the team! Bravo boys! There were so many funny images on social media about the World Cup. 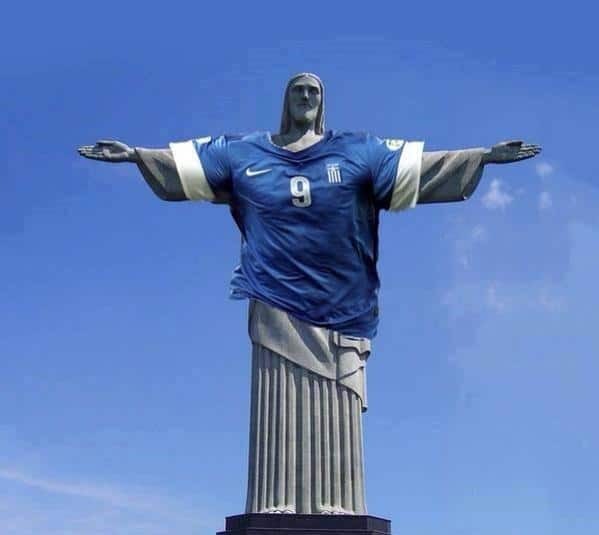 What do you think of Christ the Redeemer wearing a Greek soccer jersey! Ellas Ellas Ellas! Previous Previous post: FIFA World Cup Soccer – GREECE! Next Next post: From Yaffe Group Tidbits Blog? Hello & Welcome!